Great news for everyone, except Scottish and Northern golf fans, the British Open Championships is coming to Sandwich, Kent once more in July 2011. Very much one of my home towns, Sandwich is a delightful venue and an outstanding course to host The Golf Open once more. This is the 14th occasion the historic links course at Sandwich has welcomed The British Open. Last year at St Andrews Golf Club, the South African Louis Oosthuizen won The British Open 2010. I remember watching the final day on TV and thought that Oostuizen was charming in his speech at the closing ceremony. Have you ever been tempted by the cheaper hospitality packages on the phone, oh yes, it’s a cancellation or indeed just a brilliant offsite package at the Golf Open? Please do read on. Sometimes cheap just doesn’t work. I had a meeting earlier this week regarding the Golf Open at Sandwich and the big issue of re-entry came up. 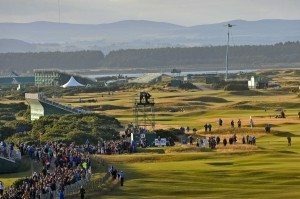 If you are a corporate customer enjoying offsite hospitality at the Open Golf, once you have gone onto the course to watch the golf, then, if the R & A don’t allow re-entry, you won’t be allowed back onto the course. Not the most ideal situation and it’s something that has yet to be confirmed. So if anyone offer you cheap hospitality, it HAS to be offsite, and you MAY NOT be able to come and go as you please. Back in 2003 when the Open Golf was played at Sandwich I probably made the worst mistake of my Team Tactics career, I bought off another supplier called European Events. This was offsite but at that time re-entry was allowed. I attended on the first day, walked into the marquee and my heart sank. Cheap, dirty, appalling and we had over 100 clients go. Sadly we lost a few clients but in 14 years that has been my biggest mistake. But guess what? The price will be more but could you put up with low rate hospitality? I certainly couldn’t put my hand on my heart and offer it to our clients. Bye the way if anyone has £400,000 to hand for the best house in Sandwich and 6 further cottages on site, do give me a tinkle!